As a political scientist specializing in the comparative politics of development, including particular attention to issues of governance and democracy, I have followed this year’s World Development Report with special interest. I have not been alone. WDRs usually attract attention, but this year’s report seems to have attracted more than most. Several constituencies have pushed for some time for a WDR on the topics addressed in this report, and there thus was a lot riding on it in terms of hopes and expectations for a strong statement on governance. This WDR does not disappoint. As more than one commentator has noted, it is a landmark document, with potentially far-reaching implications for work in international development. I focus on four implications here. The first two have been highlighted in other commentaries, but are important to review. The second two have received less attention thus far, but in my view are no less important. The report brings power and politics squarely into view in work and thinking on development. First, the report brings power and politics squarely into view in work and thinking on development. For political scientists like me, this is hardly a controversial point. But, it is a very important point to make for the field of development more broadly, and for development economics in particular, where technocratic and apolitical approaches have been so influential. The report draws impressively on diverse literatures to advance a nuanced argument about the ways in which governance, politics, and institutions influence development outcomes. This is not to say that this is the first statement by the World Bank on governance. It has worked on governance for some time, and several previous WDRs have dealt with governance-related topics (see, e.g., 1997, 2002, and 2004). But, the World Bank traditionally has worked with a notably more narrow approach to governance, and it has had an uneasy relationship with discussion of political governance, power, elections, and civil and political rights – topics considered centrally in this report. 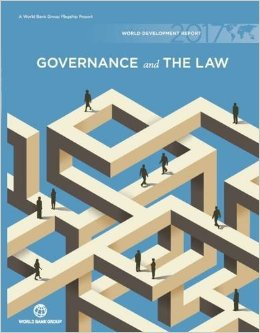 It has become abundantly clear that work on governance should move beyond focus on one-size-fits-all “forms” and models. This focus speaks to one of the major critiques made of earlier work on governance in the 1980s and 1990s (by the World Bank and other organizations), for essentially being too much about “form.” Merilee Grindle, for instance, catalogued the long laundry lists of “good” institutions and practices promoted as part of the good governance agenda, arguing that fulfilling such lists was unrealistic and calling instead for “‘good enough’ governance” as the best way for countries to move forward. Matt Andrews has a great line critiquing this sort of old school approach to good governance as “suggest[ing] a one-best-way model, ostensibly of an idyllic, developed country government: Sweden or Denmark on a good day, perhaps.” In short, it has become abundantly clear that work on governance should move beyond focus on one-size-fits-all “forms” and models, which provide an unrealistic basis for governance reform, are not easily replicated, and are not necessarily appropriate to the situations in which they have been applied. 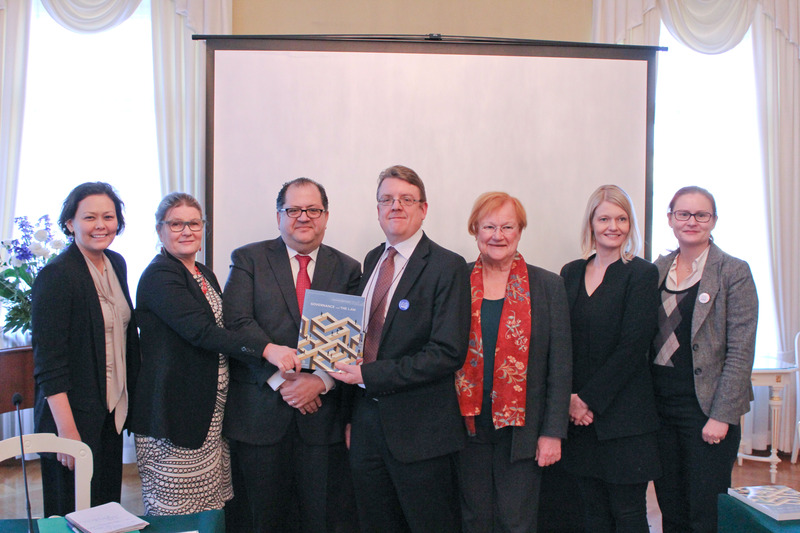 UNU-WIDER's Rachel Gisselquist spoke the launch of the 2017 World Development Report in Helsinki, Finland. This leads to my third point. Another major implication of this report – one which has received less attention thus far – is that it points to the importance of inequality and exclusion as among the key contextual factors that work against policy effectiveness. This claim resonates with other ongoing discussions in development, including points raised in the 2006 WDR on equity, and in particular with the significance of inequality in the Sustainable Development Goals. This report also pushes us forward in offering some new frameworks for thinking about the relationship between inequality and development. For one, it considers some of the mechanisms through which inequality matters. For instance, systematic exclusion, it explains, likely means that the interests and needs of certain groups are not represented well within the policy arena. This in turn may influence perceptions of (il)legitimacy. It may have the effect of pushing some actors to act outside the policy arena and to resort to violence. We need more work that grapples in a nuanced way with the record, potential impact, and risks of these sorts of group-targeted policy options. This WDR also notably pays central attention to groups and to inequalities and power asymmetries between groups – perhaps even more than between individuals – as significant in the undermining of policy effectiveness. Inequality, both vertical and horizontal, is a core research area for us at UNU-WIDER – and much of my own current work focuses on group-based inequality – so I was especially happy to see this discussion in the report. In my view, the report builds very well upon a growing literature on horizontal inequality and conflict, and it also points to the need for even more work in this area. For instance, in thinking about levers of change, I think future work should go beyond those discussed in this report to consider the possibility of tackling power asymmetries more directly. There have been a number of efforts by various countries to address group-based inequality through targeted policies or positive discrimination (e.g., affirmative action in the United States, reservations in India, the New Economic Policy in Malaysia, Black Economic Empowerment in South Africa, various reforms to support indigenous populations in Latin America). While it is easy to say that we support disadvantaged groups and more inclusive policies, such efforts have been highly controversial. We need more work that grapples in a nuanced way with the record, potential impact, and risks of these sorts of group-targeted policy options. We should move beyond a focus on the rule of law, to consider the role of law in shaping behavior, ordering power, and providing a tool for contestation. A fourth and final implication to highlight has to do with the discussion of the law in this WDR, which has received a lot less attention by commentators than the discussion of governance. The report highlights that we should move beyond a focus on the rule of law, to consider the role of law in (1) shaping behavior, (2) ordering power, and (3) providing a tool for contestation. In my view, this third role of law is particularly interesting. It focuses on “how citizens—nonelites—use law to challenge and contest the exercise of power,” promote accountability, and foster “more equitable bargaining spaces.” In considering political contestation and accountability, many of us think first of elections, and the WDR correctly reminds us of these non-electoral channels for accountability and contestation. The discussion of the role of law in this sense also points to the relevance of a growing body of work in international development on access to justice and legal empowerment more broadly. Perhaps the most well-known legal empowerment initiative is Timap for Justice, a community-based paralegals program in Sierra Leone, but legal empowerment initiatives exist throughout the world and take a variety of forms. Many legal empowerment initiatives aim explicitly to benefit both the poor and the socially disadvantaged. Some, such as Namati, aim explicitly to help people “to understand, use, and shape the law” (italics mine). This WDR then underscores the relevance of continuing work on the role of law along these lines – by both researchers and practitioners. In sum, this report is extremely rich and worth reading. While there are certainly points on which I disagree or where I think analysis could have been pushed further, the big picture is that this report has a number of important implications, which could have far-reaching impact on both development practice and research. This article originally appeared in Let's Talk Development, a blog hosted by the World Bank's Chief Economist. It been republished with the permission of the World Bank and the author. Dear Nicholas Kristof, We Are Here, Too!